Labor Day is now seen as the official end of summer and a day off (at least for those who actually get paid holiday leave) to grill or go to the beach one last time. But when it was originally conceived as a federal holiday, it was as a concession to the labor movement after bloody union unrest that left 30 striking workers dead. It was meant as a day to celebrate the efforts and sacrifices of unionized workers. 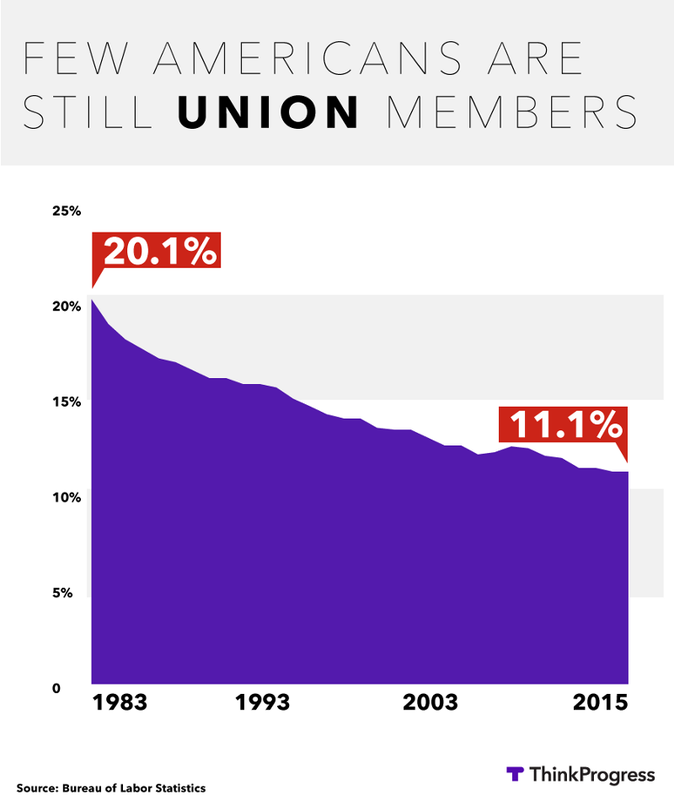 A shrinking share of Americans are union members today. But the benefits brought about by the union movement are still just as strong, particularly when it comes to workers’ pay. Being in a union is particularly helpful for marginalized groups that tend to be paid less than white men. A new report from the Center for Economic and Policy Research found that black union workers earn wages that are, on average, 16.4 percent higher than black workers who aren’t in a union. The same is true for women: a report from the Institute for Women’s Policy Research found that women in a union earn 30.9 percent more than women who aren’t unionized. Unionization also yields salary benefits for white men, who get a 20.1 percent boost for being in a union. But the wage-boosting power of unions has been hampered as the share of workers who belong to one has declined. In 1983, the earliest year the Bureau of Labor Statistics has data for, 20.1 percent of the workforce belonged to a union. Today that share has been cut nearly in half, down to 11.1 percent. That’s hurt everyone’s wages, not just unionized workers. The wage-boosting power of unions usually spills out into other workplaces because they set standards that everyone ends up adopting. 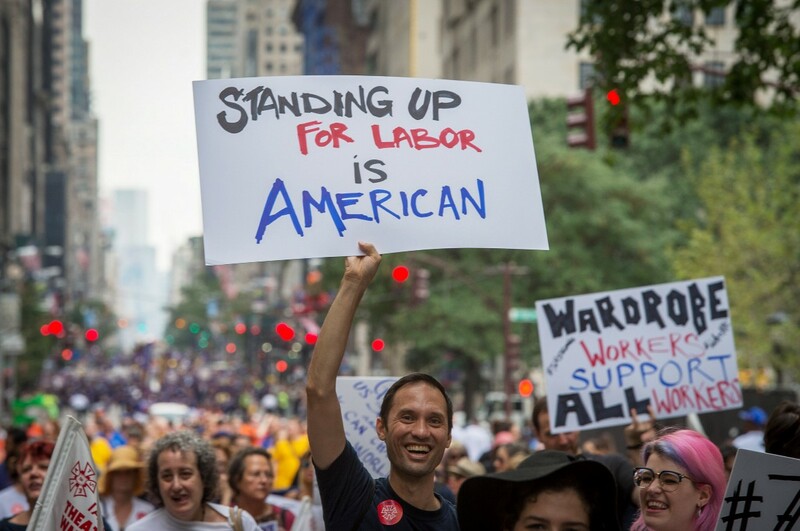 A new report from the Economic Policy Institute found that for men working in the private sector who aren’t in a union, their weekly wages would be about 5 percent higher if union membership had stayed at the same rate as it was in 1979. That would mean an extra $2,704 per year on average. 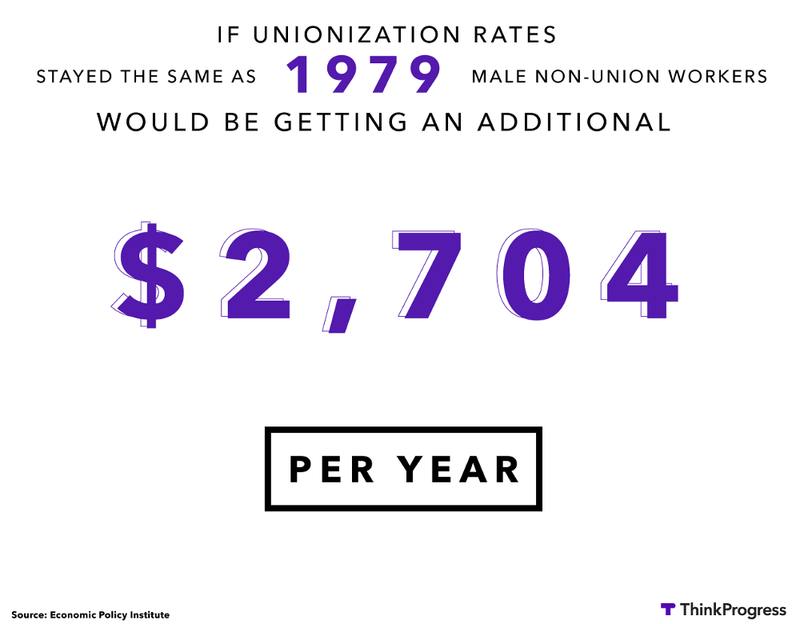 Non-union women would also benefit, but the impact would be smaller- a 2 to 3 percent increase in wages- because women have historically been a much smaller share of union workers. The drop in union membership, and the subsequent erosion of the wage benefits for all workers, has played a role in widening wage inequality, holding down pay at the bottom of the scale but less so at the top. In fact, other researchers have found a strong correlation between the fall of union power and the rise of income inequality. This article was originally posted at Thinkprogress.org on September 5, 2016. Reprinted with permission. Bryce Covert is the Economic Policy Editor for ThinkProgress. Her writing has appeared in the New York Times, The New York Daily News, New York Magazine, Slate, The New Republic, and others. 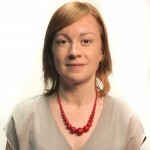 She has appeared on ABC, CBS, MSNBC, and other outlets. This entry was posted on Monday, September 5th, 2016 at 3:38 pm. You can follow any responses to this entry through the RSS 2.0 feed. You can leave a response, or trackback from your own site.